Babies with the rare, deadly genetic disorder Sandhoff disease begin to miss developmental milestones just months after birth. Lacking muscle tone, they never learn to sit up, develop heads too large to lift and eventually suffer uncontrollable seizures. There is no cure. "With excellent supportive care, children can survive until age 5 or so," said Dr. Cynthia Tifft of the National Human Genome Research Institute, part of the National Institutes of Health. A paper appearing in the March 1 issue of the Journal of Lipid Research by senior investigators Tifft and Richard Proia and lead author Laura Allende of NIH's National Institute of Diabetes and Digestive and Kidney Diseases, and their colleagues, describes an important step toward gene therapy for patients with Sandhoff disease. The disease is a lysosomal storage disorder. Enzymes in the lysosome normally break down unneeded molecules. When one doesn't work, the molecule it should degrade begins to accumulate. Sandhoff disease affects an enzyme that breaks down complex lipids called gangliosides. Ganglioside accumulation eventually causes cell death in the brain and spinal cord. The researchers wanted to know whether the problems that appear very soon after birth in Sandhoff patients actually develop during pregnancy. The disease is ultra-rare; Tifft estimates five children are born with it in the U.S. each year. Therefore, most of what is known about the disease comes from studying genetically engineered mice, which are not a perfect comparison. This study began when a baby with Sandhoff disease came to Tifft's clinic, where the medical geneticist treats patients with infantile and milder adult-onset forms of the disease. Researchers took skin cells from the baby and reprogrammed them into induced pluripotent stem cells. Those cells, like the ones in an embryo, can mature into any cell type in the body. The team created healthy control cells by using CRISPR/Cas9 genome editing to correct one copy of the affected gene in the patient's stem cells. The researchers then induced the two sets of stem cells to grow into simple groups of brain cells called organoids, about the size of the eraser on a pencil. 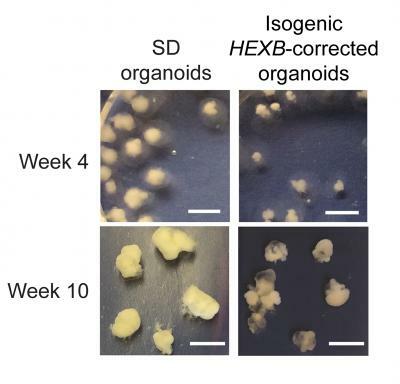 The researchers compared the healthy and Sandhoff-affected organoids to find out how the disturbed enzyme might affect early development. As expected, researchers saw accumulation of ganglioside molecules in the Sandhoff organoids. The healthy organoids did not show this accumulation, confirming that the genetic intervention had worked. But the researchers also found something surprising. "The major feature of this disease, in humans and in mouse models, is the neurodegeneration," Proia explained. But instead of cell death in the Sandhoff disease organoids, the researchers saw cell overgrowth. Although there was no difference between the stem cells, the Sandhoff organoids were much larger than the healthy ones, mimicking the large brains of patients. The profile of genes expressed in the healthy organoids looks a lot like the first trimester of pregnancy. However, the researchers found that the organoids with Sandhoff disease had changes in genes that govern cell maturation. Instead of settling into a role as differentiated adult cells, the Sandhoff cells just kept growing. It remains to be determined how the disrupted ganglioside enzyme leads to changes in gene expression. "Most of us have been thinking of lysosomal storage diseases as if everything is just fine until these molecules begin to build up," said Ron Schnaar, a professor at Johns Hopkins University who researches gangliosides in the brain and was not involved in this study. "But there has always been a bubbling issue of whether the molecules themselves have an effect, other than building up to tremendous amounts." Schnaar said this paper is the first to address that question, showing that disruption of gangliosides does affect brain development in humans. CRISPR, the researchers' original approach to correct the gene, is still far from the clinic. Therefore, the researchers also tested a more practical gene-therapy approach, which had already been successful in animal models of Sandhoff disease. They used a virus to introduce the gene to Sandhoff organoids that were 4 weeks old. About two weeks after receiving the gene therapy, the organoids that had been treated were closer in size to the healthy organoids and no longer had large clumps of the ganglioside. "That's the first proof of principle in a human model system that gene therapy may actually be beneficial for these kids," said Tifft. The viral gene-therapy approach is in clinical studies for other lysosomal storage disorders, and the first FDA-approved gene therapy for any genetic disorder uses a similar virus. Unfortunately, the patient whose skin cells were used for this study died at age 4. While it comes too late for her, the research strikes a hopeful note for future generations of children with Sandhoff disease.